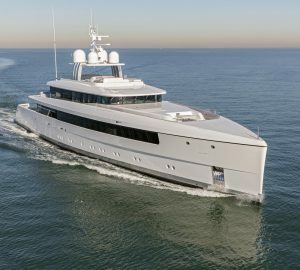 Built by Feadship in 2003 and last refitted in 2011, this 43m/141ft Custom Superyacht has the naval architecture and exterior styling of De Voogt and the interior styling of Terence Disdale. 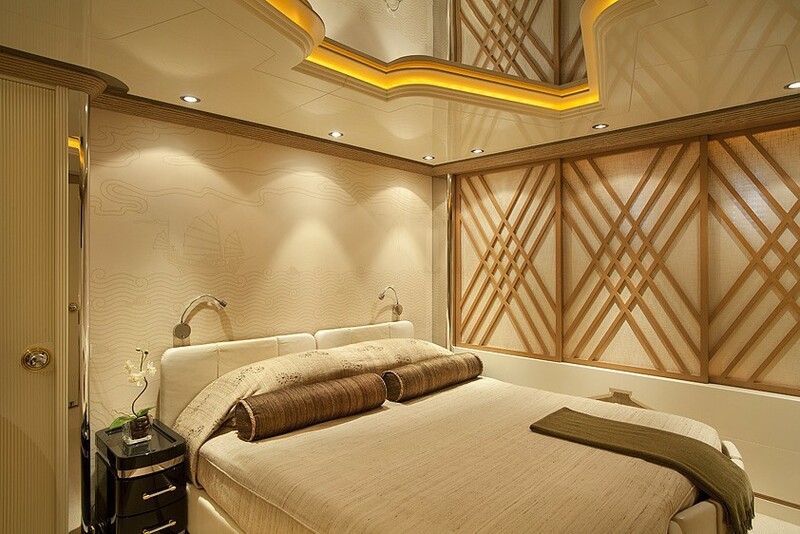 The accommodation is designed to sleep up to 12 guests over six cabins. 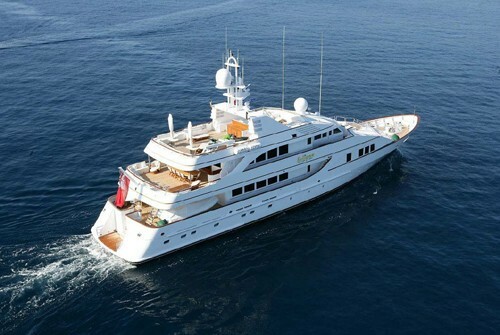 The main deck aft has room to store two tenders and a passageway between them leads down to the swim platform. 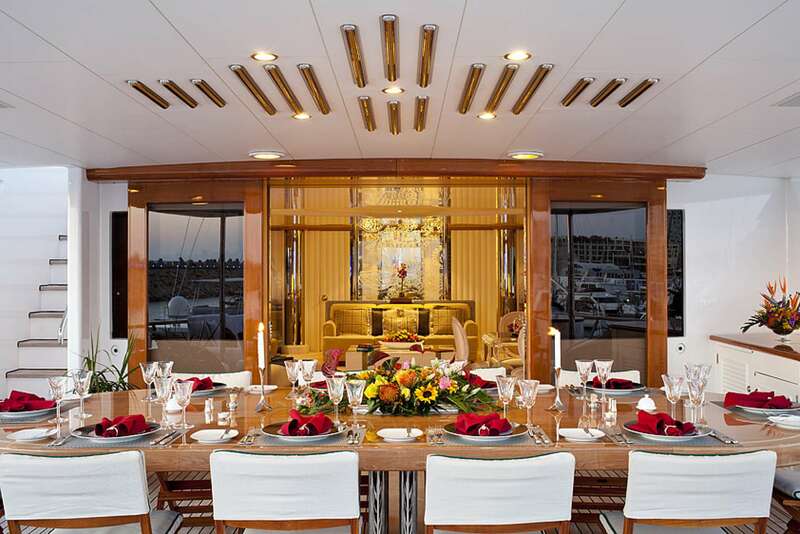 Guests can dine alfresco while enjoying the sunset from the main deck aft, and the oval table is surrounded by 12 chairs. 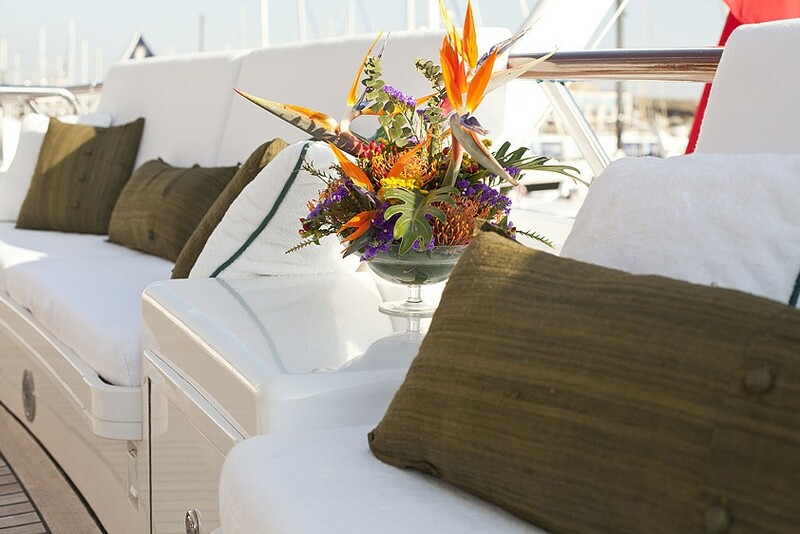 Along the stern, there is padded seating so that the group can remain outside and enjoy conversation under the stars. 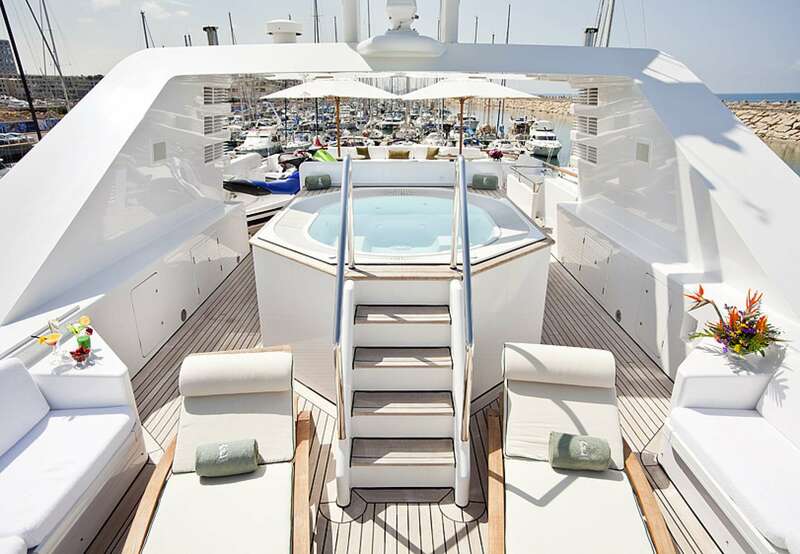 The foredeck provides a broad sunbathing area fitted with sunpads, and guests can walk down to the bow to take in the sweeping forward views as they exercise. 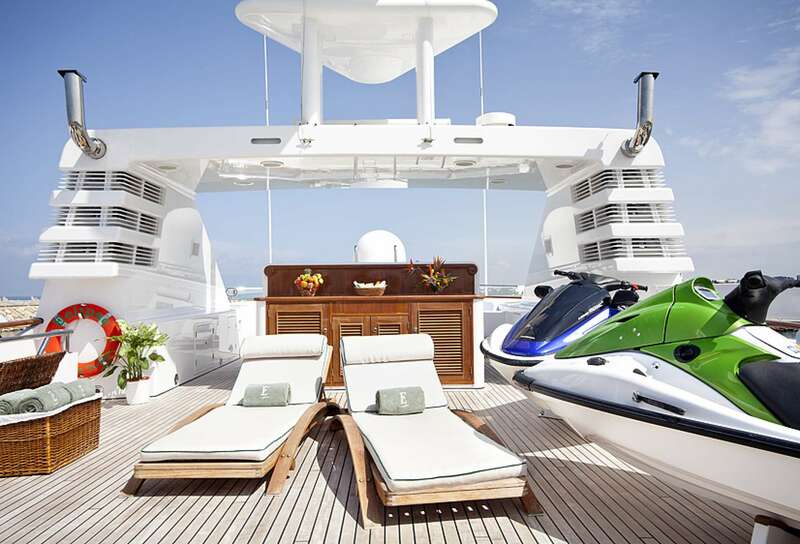 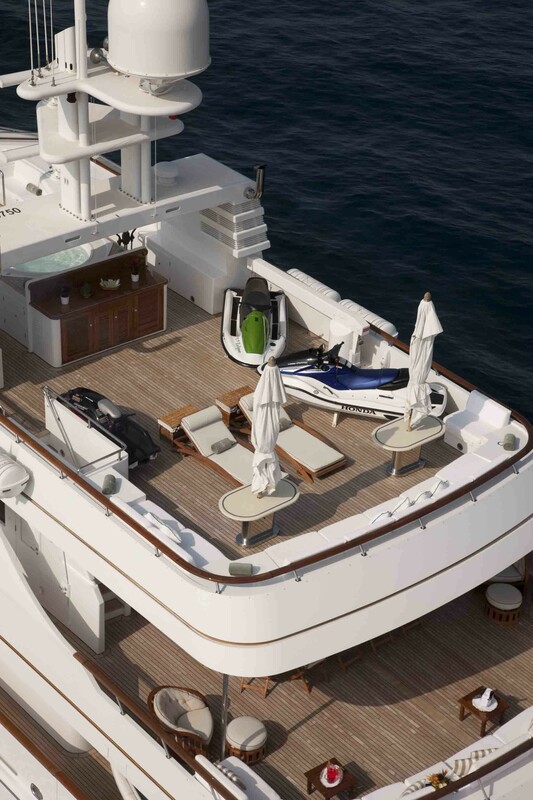 On the sundeck, the stern has integrated seating and two drinks tables with sun umbrellas along with two sun loungers and space for the motorised water toys. 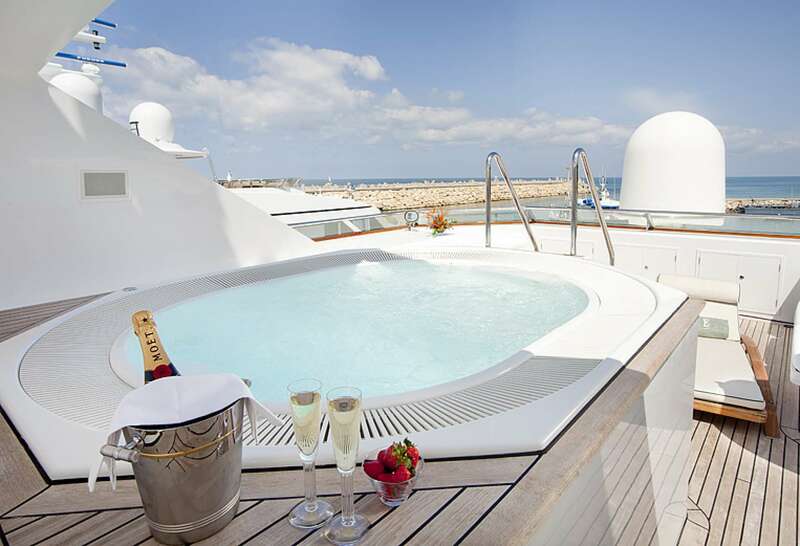 A tempting raised Jacuzzi is forward of centre and sofas and sun loungers occupy the forward area. 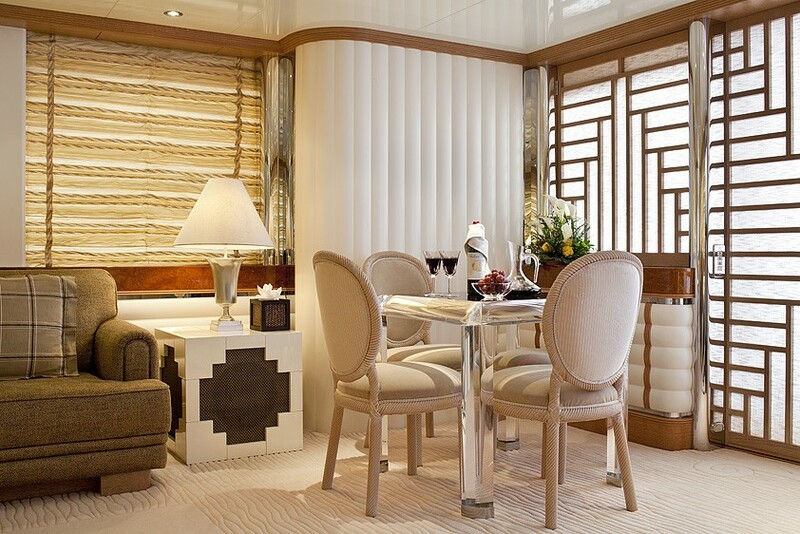 The contemporary interior from Terence Disdale uses a cream colour scheme with brown accents and uses soft shapes with a marine theme. 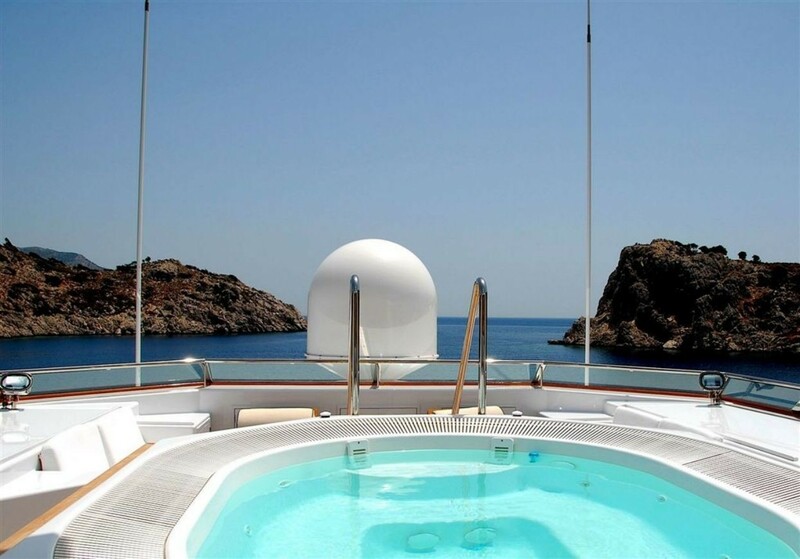 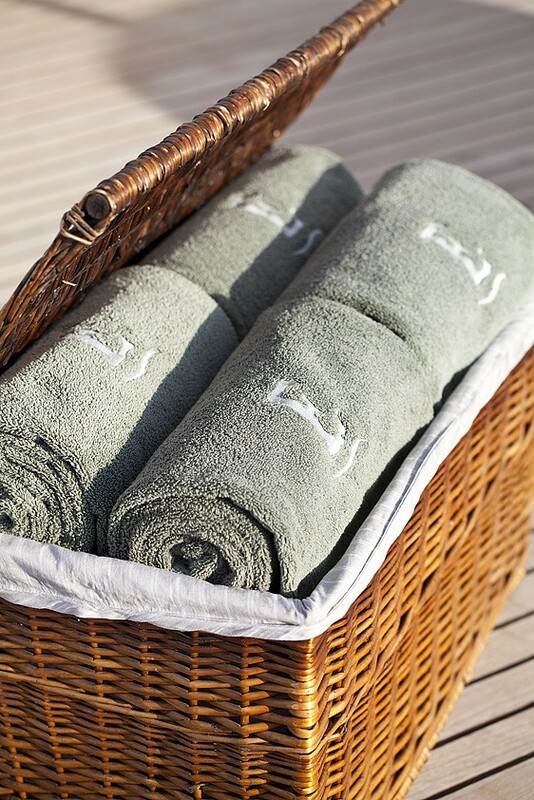 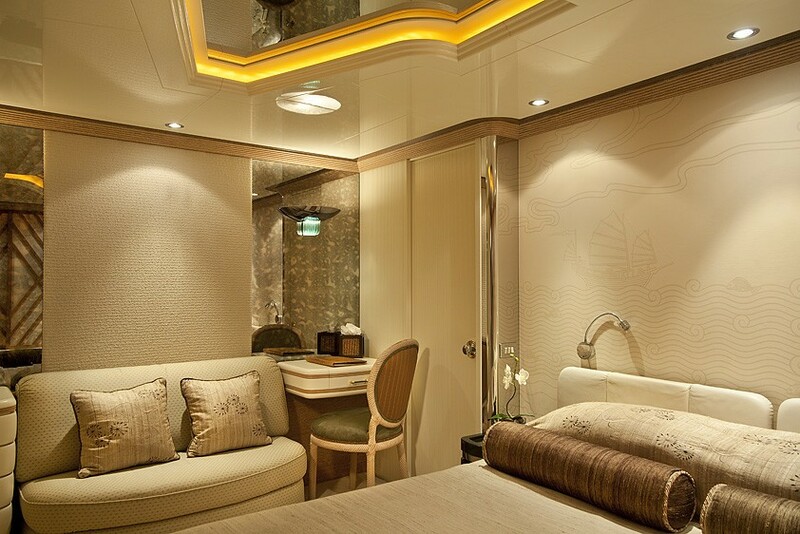 The lower deck places two double cabins and two twin cabins in the aft, all of which have en-suite facilities. 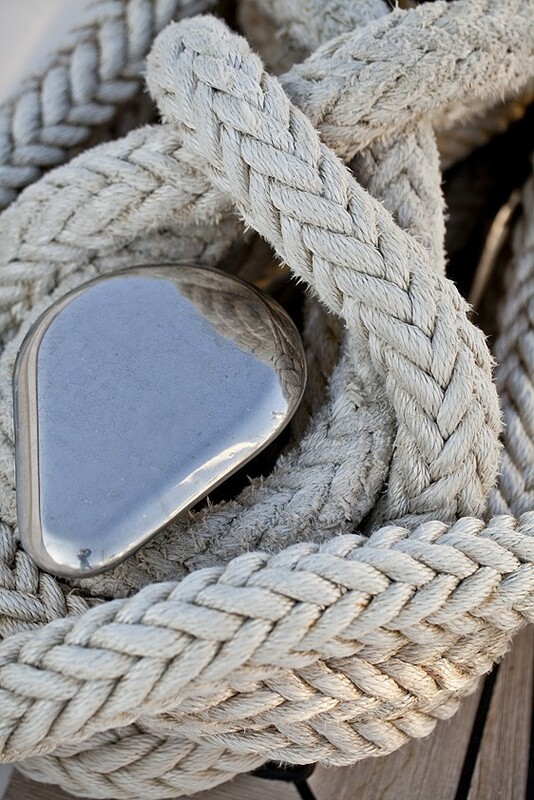 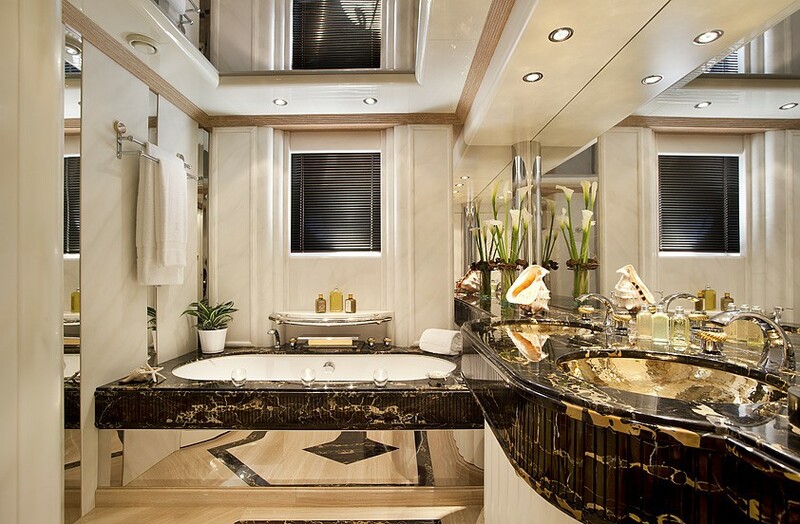 Amidships is the engine room and forward is the crew accommodation. 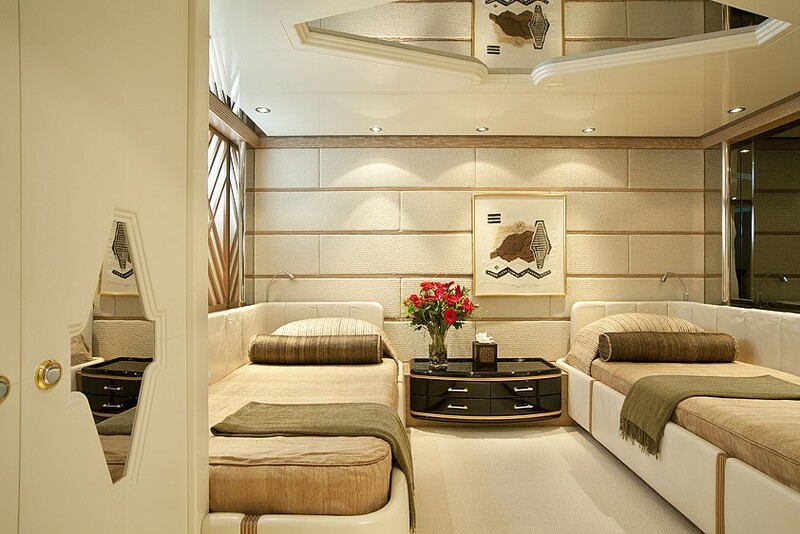 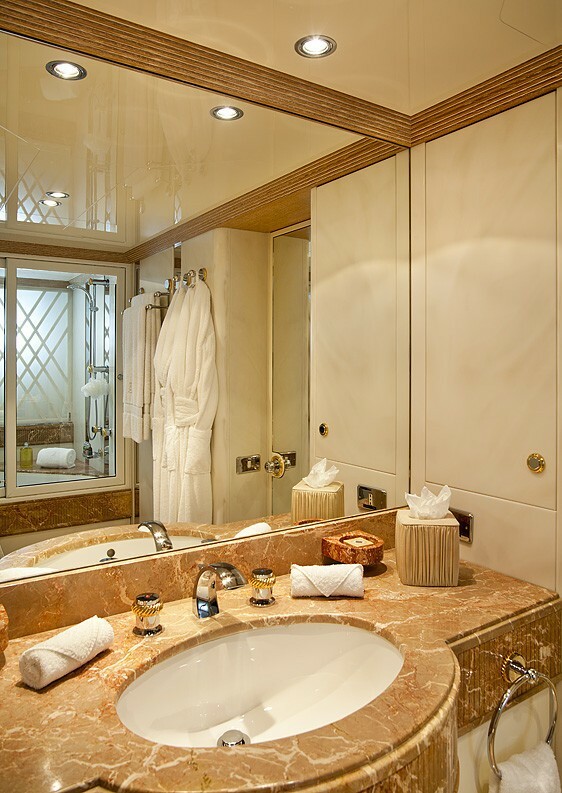 Above, the main deck forward contains the full-beam Master suite, which contains a lounge and an en-suite bathroom. 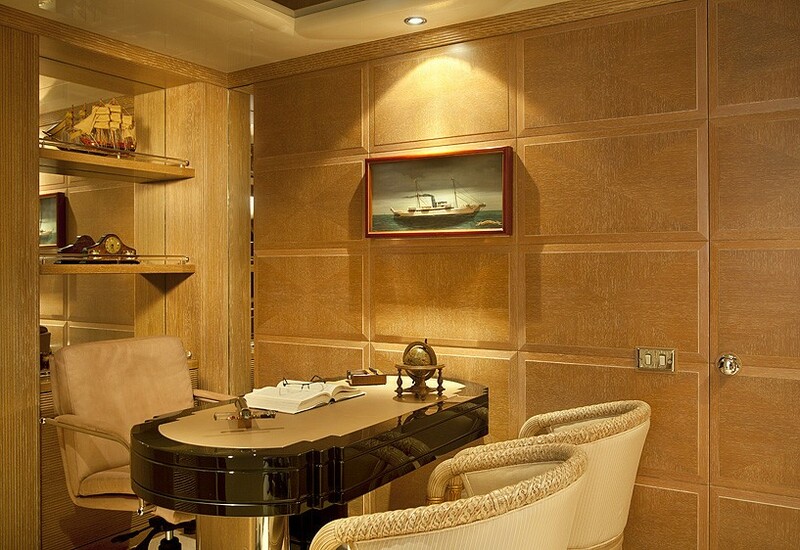 Also attached is a study and a children's room. 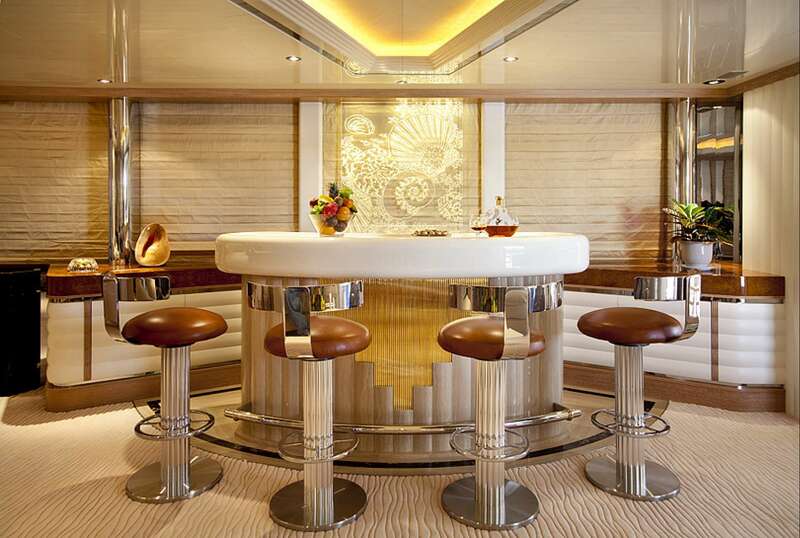 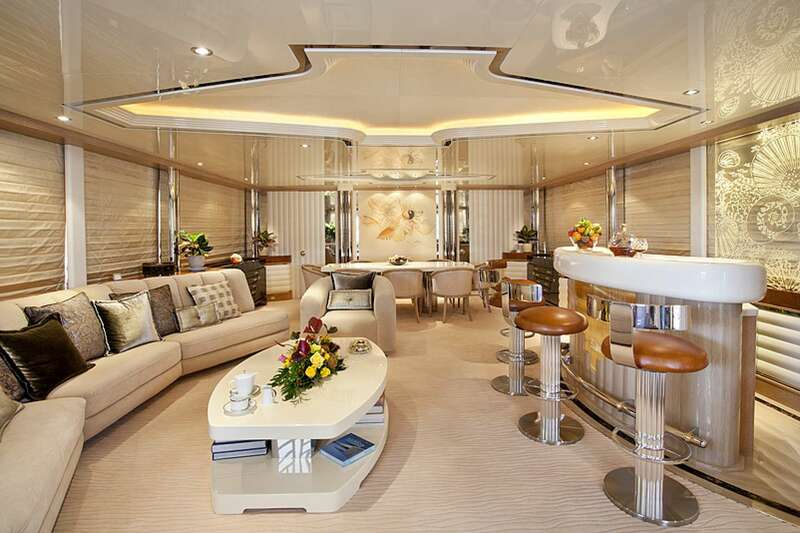 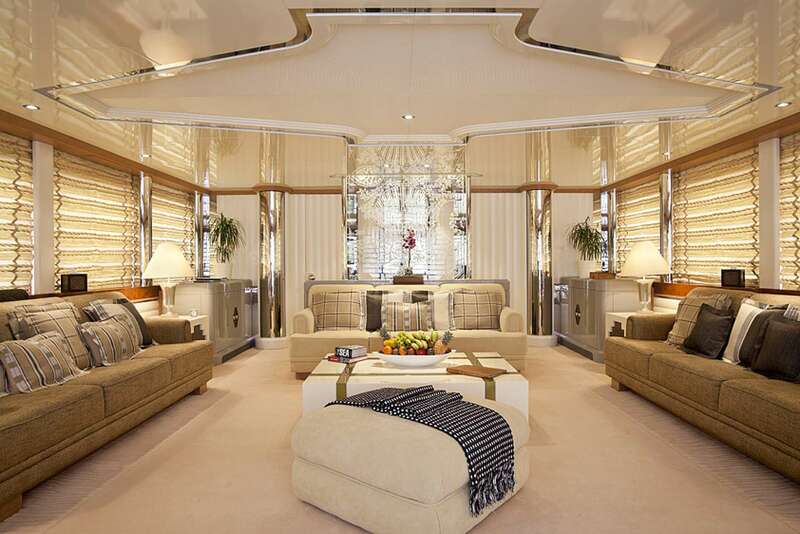 A passageway around the galley leads to the main salon, where the formal dining area to seat 12 is placed forward and the centrally located bar efficiently serves guests while dining or lounging on the extensive sofa opposite. 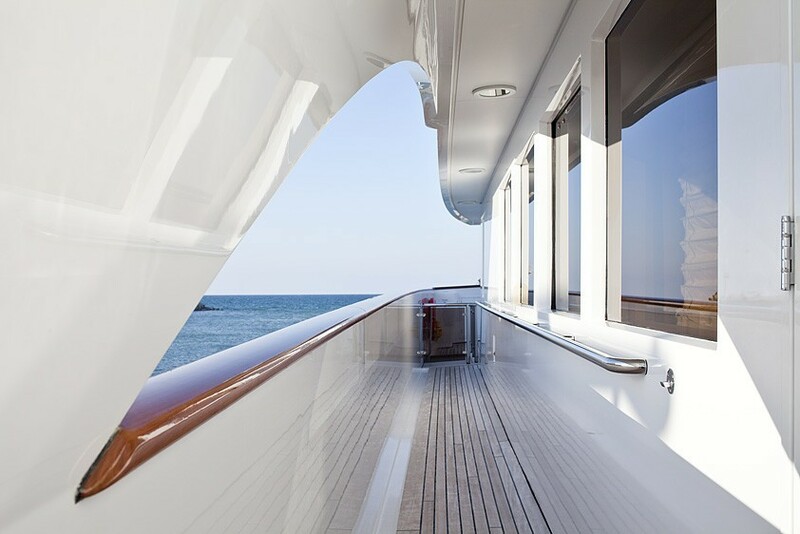 A sliding glass door to the leads out onto the side deck and opens the salon up to the fresh air and ambient sounds of the location. 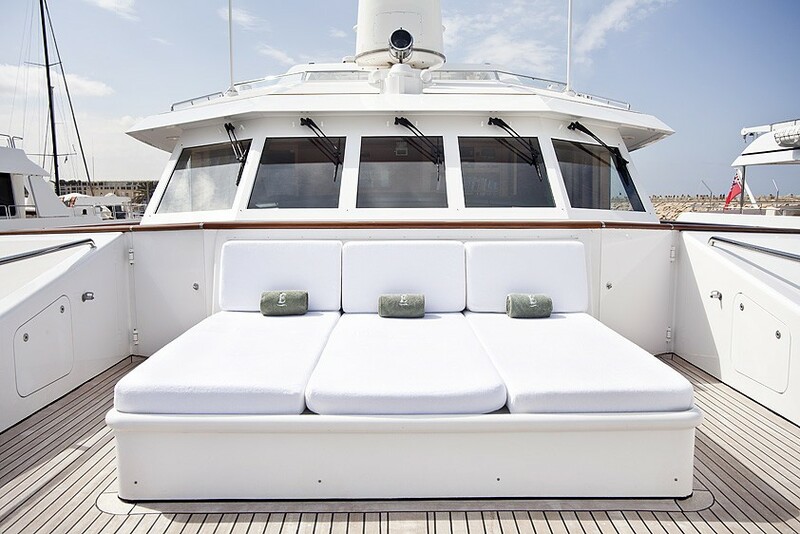 The upper deck forward hosts the helm station and Captain's cabin, behind which the sky lounge offers guests an extensive alternative living space. 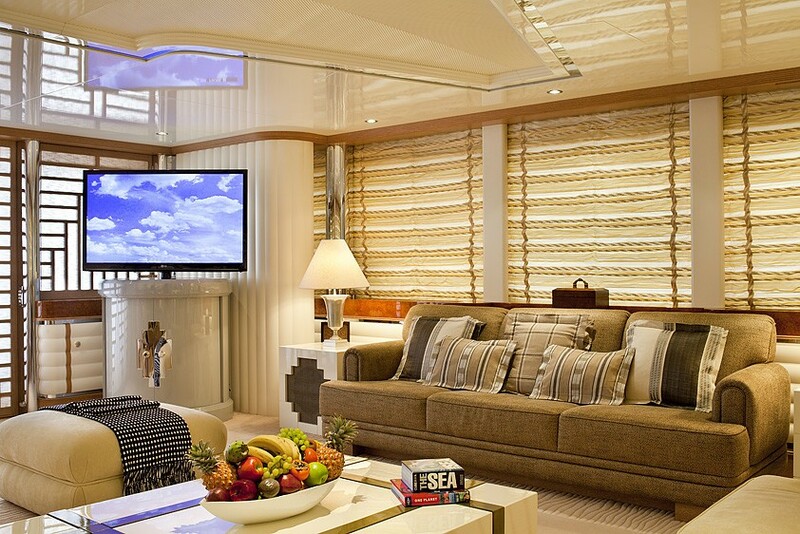 Extensive windows flood the interior with plenty of natural light to the benefit of the three sofas that surround a central coffee table. 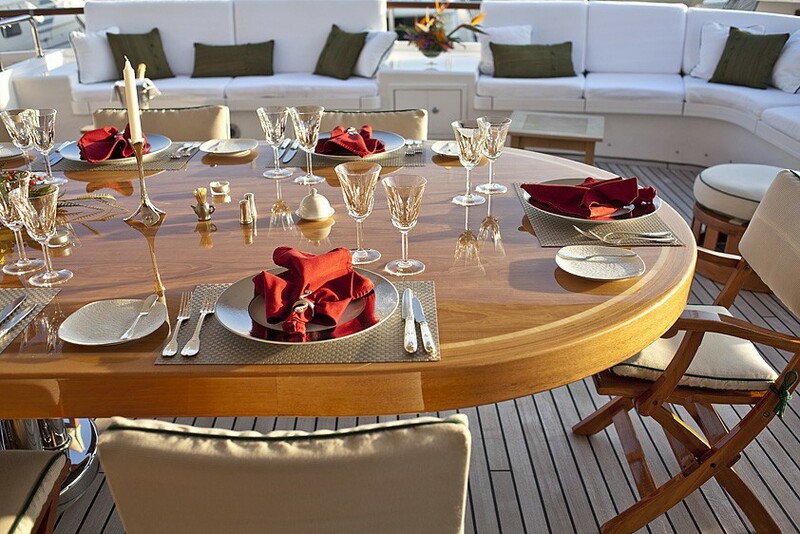 Near the aft sliding doors is a circular games table with four chairs to add to the evening entertainment. 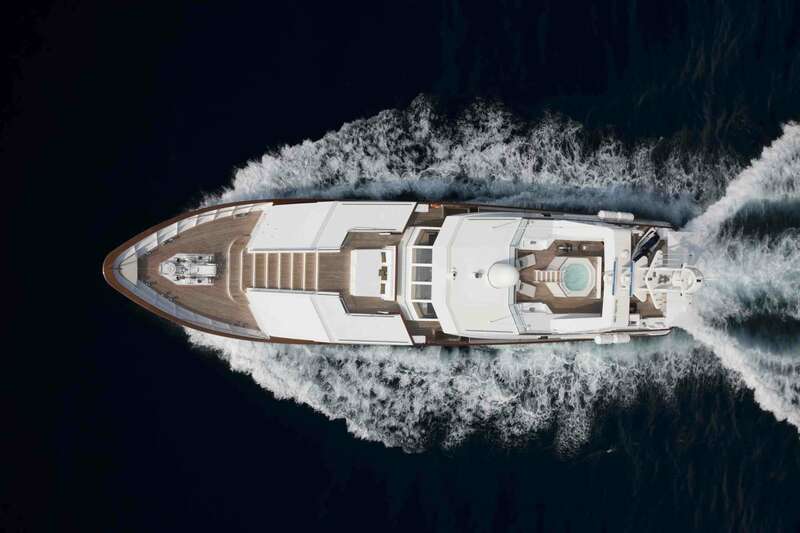 2 x 3508 Caterpillar engines allow for a cruising speed of 12 knots. 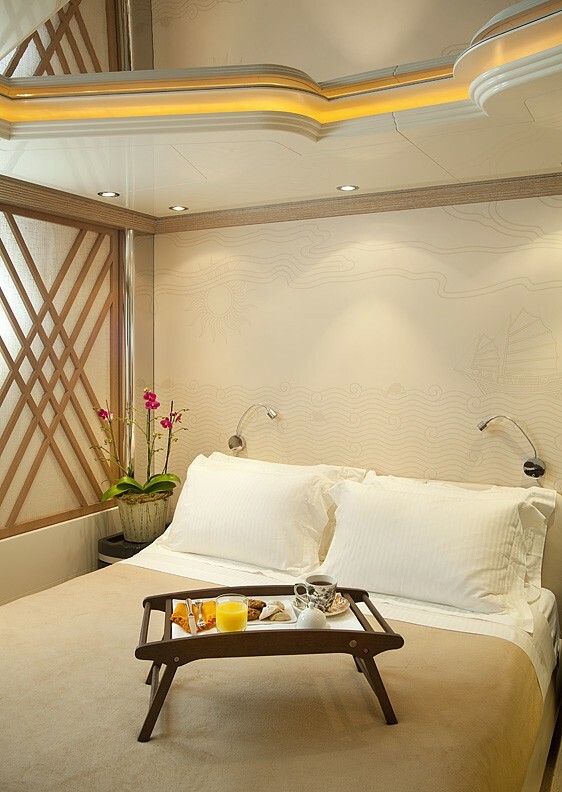 The accommodation sleeps up to 12 guests over 6 cabins: 1 Master suite, 2 double cabins and 3 twin cabins, all with en-suite facilities. 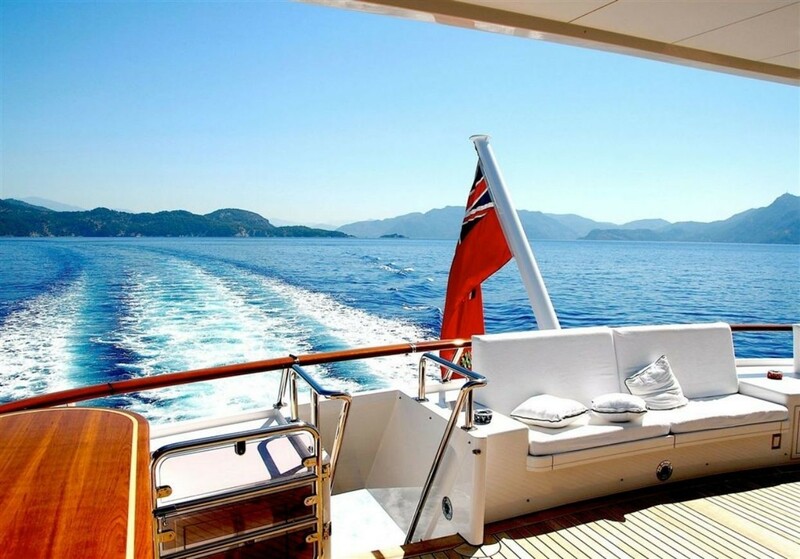 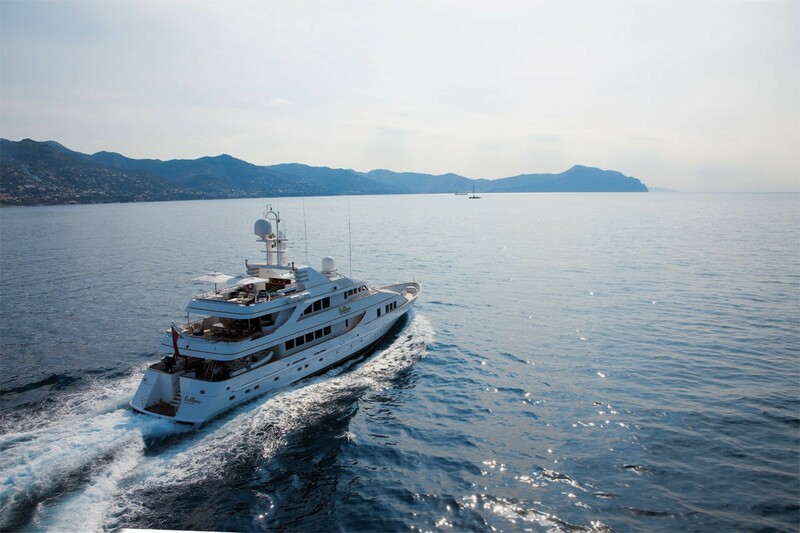 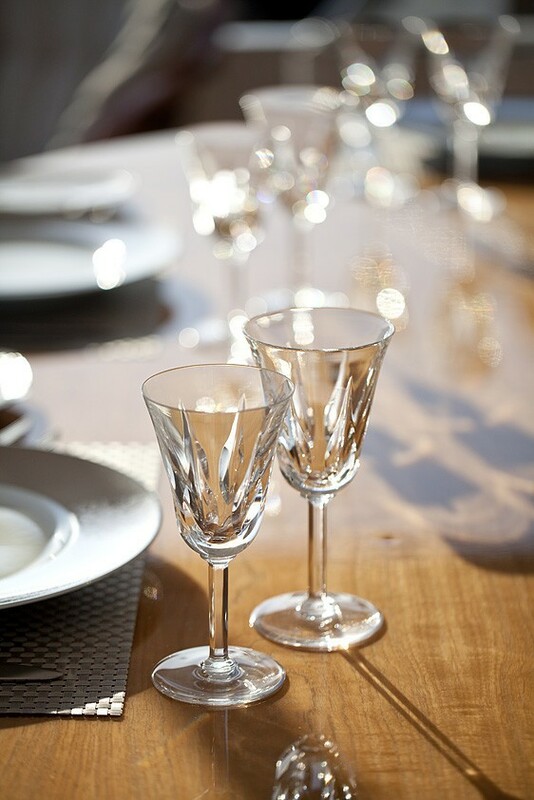 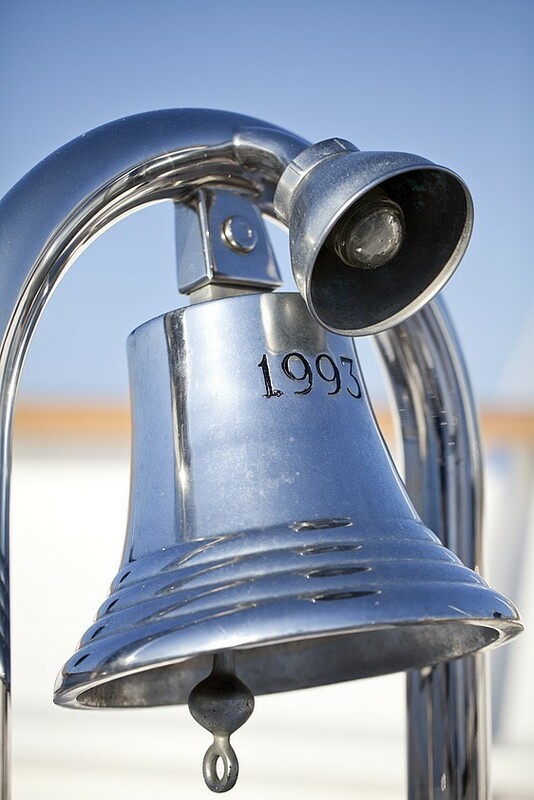 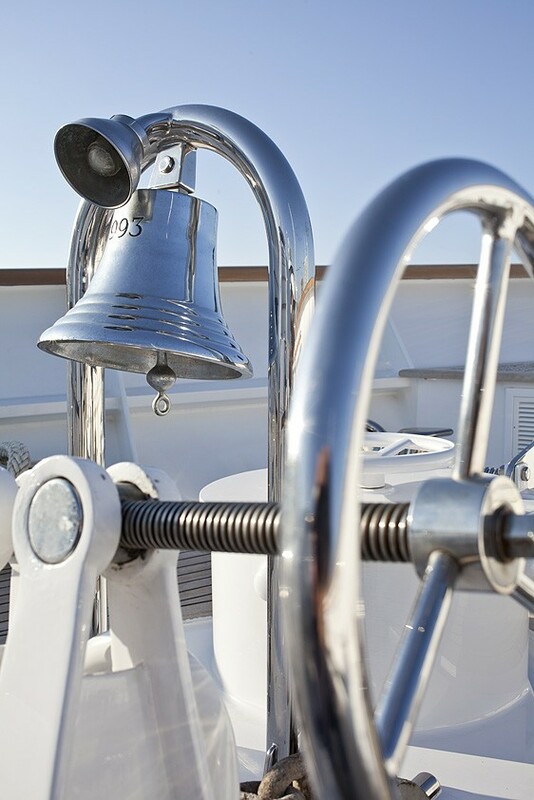 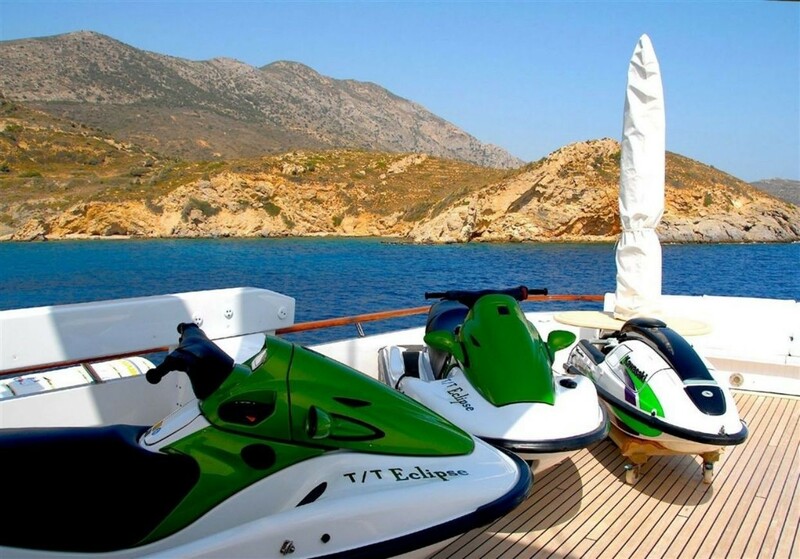 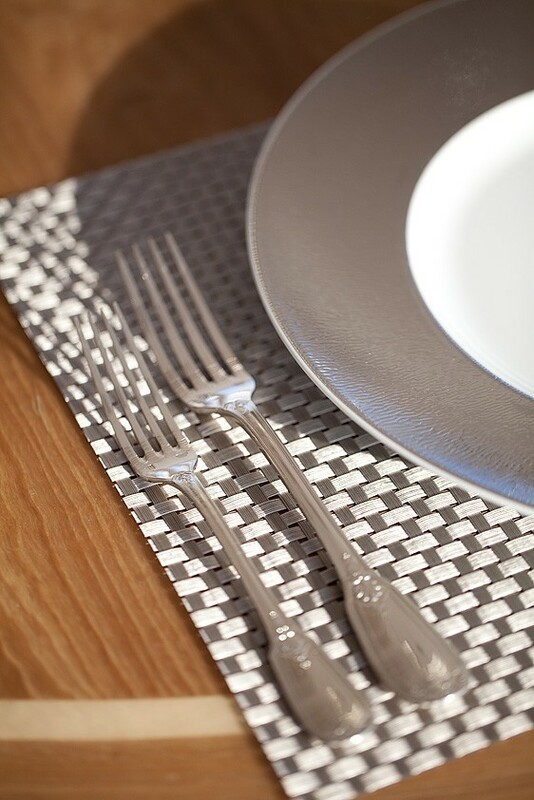 The professional crew of 10 will provide everything required for a smooth and satisfying cruising experience.